Home › Ideas › Business › 3 Management Concepts Businesses should use. 3 Management Concepts Businesses should use. There are three concepts businesses should use. Apply these concepts correctly than businesses, employees and customers will all benefit. In modern business it’s the role of management to cut costs and leverage on borrowings. Which can explain why most established businesses fail. Some of our iconic brands are on the edge of collapse. Companies like Nokia and Sony are starting to collapse, while Kodak and United Continental are trying to trade their way out. So what are these three management concepts? 1) Mittelstand. This German concept is fascinating. Successful Mittelstand companies adopt modern management practices but use caution and long-term oriented approach to business. They emphasis on long-term profitability, while most public companies try to meet quarterly and annual shareholder expectations. Another advantage is that managers work with the employees because they love the business and treat them like family. In bad times, management and employees take pay-cuts and in good times they share the profits with everyone. Not many senior managers of public companies would do that. 2) Customer Service. Most businesses believe they have good customer service. However, I feel most have missed the mark. Customer service is about providing the customer with a product or service that will add value or benefit to them. It’s the way they experience your brand that builds your business. If you focus on your customer then you build brand trust. A business is like another person, it needs to build a relationship with the customer and communities. Nordstrom is a good example. 3) Innovation. This is vital for business growth. It’s about risk and experimentation to build a good product or service that the customers values. For each time we fail, we learn a new way to reach our goals. 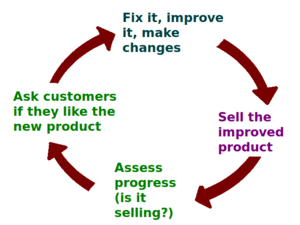 Businesses that fail to make improvements will fall behind. Putting it together may seem hard but it’s possible. By using Mittelstand concept, focus your business using caution and long-term goals while creating a family like atmosphere. Share good and bad times with your employees and they’ll help grow your business. Focus on the customer and the service you offer to them. People are creatures of habit and do things that they had a good experience with. Always innovate your business by improving on services or the products for the customer. Can you think of a product or service that you can improve on? Or does one of your employees have an idea on how to improve the product or service? Or is it a new product or service that will help your business? My brother recommended I may like this website. He was totally right. This publish truly made my day. You can’t consider just how much time I had spent for this info! Thanks! Having read this I believed it was extremely informative. I appreciate you finding the time and energy to put this informative article together. I once again find myself personally spending way too much time both reading and leaving comments. But so what, it was still worthwhile! I enjoyed reading your comment and glad you found the article informative. I also spend too much time reading and commenting on the net. I agree with you that it is still worthwhile. Cheers. Hi there! I could have sworn I’ve visited your blog before but after browsing through a few of the articles I realized it’s new to me. Anyways, I’m certainly happy I discovered it and I’ll be bookmarking it and checking back frequently! I’m glad you discovered my blog and that you enjoyed reading the articles here. Thanks for your comment. Glad you liked the article and the information that you got from it. Glad to have shared the information with you, Blake. Alise, I’m happy to have enlightened you. Can I simply just say what a comfort to uncover a person that genuinely knows what they’re talking about on the internet. You certainly understand how to bring an issue to light and make it important. A lot more people have to check this out and understand this side of the story. I can’t believe you’re not more popular since you definitely have the gift.